I have invited a bunch of my favorite teachers to invade my studio for a long weekend of intense art-making! Friday will be Gelli Plate Printing (like finger painting for adults), Saturday is Bookmaking, Sunday is Labyrinths and Jewelry, and Monday is Sketching and Journals. Click HERE for all the details and to see samples of what we will make. Sadelle Wiltshire of Vermont is teaching this workshop in collaboration with Daniela Mellen, Gelli Print queen, from New Hampshire…. 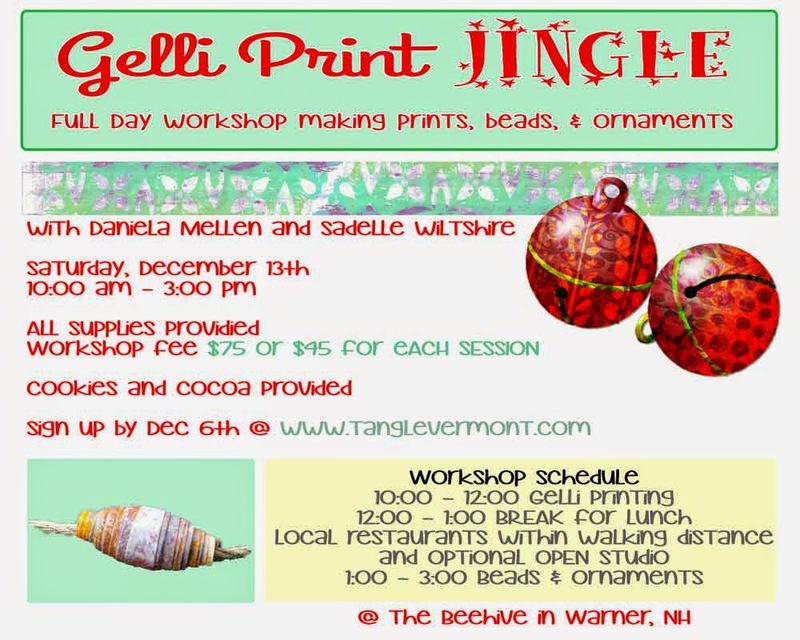 we’ve got a fun holiday themed, full-day workshop of color, ornaments and beads, at the BeeHive Studio in Warner NH!